Well it was going to be a big weekend for the 2010 KarriCup from the start, with a few weeks of organising and getting prepared, most of us managed to make it. Unfortunately a few of the crew dropped out due to work commitments (next time guys). The caravan was picked up on Friday afternoon and bikes readied that evening. Saturday morning was almost a no go when someone’s alarm didn’t go off. Luckily the missus woke up and we got the show on the road with not too much time out. The car was packed and we hit the road for the trip south. Normally a trip south is a couple of hours and not too bad but towing an ‘anchor’ in big winds can double that and the fuel usage. Eventually we made Pemberton were the fellow SPR guys were to race the Pemberton Classic. A quick stop here to drop off a jersey(thanks Kimbo) for Dave then onto Northcliffe to set up camp and have a quick rest. We made Pemberton in quick time and arrived to the SPR crew warming up and getting ready for their Crits races. The lads were looking sharp with a good showing of force in the SPR Team kit. The guys put in some big efforts to make a few key placings, despite the unbalanced grading. (full report here) While in town I caught up with a few of the locals from when I grew up and caught up on the goss about the new MTB course being built. After the completion of the Crits races we bad the guys farewell and wished them luck on the road race the next day. From here we headed back to Northcliffe with Dave in close pursuit for our pasta dinner and a good sleep before the race ahead. The campsite was packed with fellow riders and I ran into a few of the regulars who get to these events and had a quick chat about plans for the next day. After a good carb load dinner and final bike and kit prep we were off to bed. No sooner had I fallen asleep (had a pretty average nite trying to sleep properly) and it was time to rise. The park was springing to life with bikes and riders everywhere. We had a quick breakfast and kitted up for the short ride to the start at the Northcliffe recreation oval. Everyone hustled around the start to hear the pre race briefing, catch up with friends and chat to other riders. Before we knew it though the start was underway. We said farewell to our support crew, my wife & father(thanks guys, was much appreciated by the 3 of us), and got under way. The start was slightly staggered but maybe not quite enough to avoid the congestion on the Round Tu It single track. It was a quick start for most until that point when it became a stop or walk situation for a little bit, but eventually things sorted themselves out and there was free roads ahead. After the Round Tu It single track there was some open road and fire trails to get riders warmed up. Just before this ended and we hit the paddocks, riders had to negotiated a nice sand patch before the Borara Rd crossing. This proved entertaining to watch as inexperienced riders came unstuck or got caught out. It was then thru some paddocks, over a dam wall, past some cows and back into the bush. Fast flowing sections of firetrails and single track ensued broken up with a couple of river crossings which proved a bit too much for some riders who didn’t exercise caution and had some OTB moments. Thankfully the few incidents I saw were not too bad. It wasn’t long and we were into the Borara State course, which brought back a bit of technicality to the ride and kept you on your toes. Soon after and we were at the end of the 1st stage, were Dave was already waiting. We had a quick rest & resupply, water was much needed as the day was warming up and then it was on the way again. Stage 2 was the shortest of the 4 and also the fastest. It was mostly flat lantana and dry swamp flats with a few minor undulations. Dave pulled away and Devan and I continued on at our own pace. There wasn’t much to say about this section as it was over pretty quick, just dusty and fast, but fun. End of stage 2 was the half way point and lunch. The organisers provided a good selection of food including fruit and sandwiches to help riders refuel. Also the local CFA had a truck setup for getting a hose down and bit of a wash to freshen up, this proved pretty popular. As I pulled in the 50km riders were just heading off. After a good rest, feed and knicks change it was back on the bike. Stage 3 started with a nice section of technical single track just to remind you this was not going to be easy. I found this by far the hardest stage of the day, not because of the actual course but more probably by the fact i had just had lunch and fatigue was setting in. This section was a good mix of terrain and even a tree across the trail (that had fallen overnight) for riders to negotiate their way thru, once some figured out that yes they were going the right way. I think I spent a fair bit of time pushing my bike on this stage as my back was giving me grief and cramping was hitting me. Mainly I think due to poor nutrition, I was finding it hard to eat even though I knew I had to, my stomach just felt nauseous. At least I was able to pump the fluids in but food was probably more needed. I eventually made the end of stage 3 where Dave & Devan were already waiting for me. I managed to get a bit of food in here which pepped me up for the final run home, even though I did have serious thoughts of throwing it in. But I had come this far and wasn’t going to give up too easily. We set off on stage 4, basically the reverse of stage 1, for home. Dave was off from the start and I hung with Devan for a bit but he soon took off as well. Back thru the other half of the Borara State course was quite pleasant and I had a little chuckle at the downhill corner, jump with a tree in the middle of it, knowing good and well that many a rider had been caught out by it earlier (the bonus of knowing a trail). Out the back of Borara and it was into a good section of flowing downhill trails, which brought some welcome relief for the legs. These continued down til the creek crossing and then it was back up again, yuk, I hate hills. Eventually it was out of the trees and back to the paddocks and I knew the end was not too far way. It was here I caught up with Devan again and we tackled the paddocks together, before he took off again. Coming thru the last paddock, the farm owner was kicking back in his camp chair (minus a beer) cheering the remaining riders on. Back thru the sand pit and along the final fire trail and I forgot about the 50m section of calf burning hill I had to negotiate. I finally made it back to the short bitumen section and rolled almost to town, the temptation to pull into the caravan park on the way and finish there was strong but with only a few kms to go I struggled on and eventually made the finish. I collapsed into a chair and stretched the legs a bit, while getting more fluids in as it had been a hot day. We watched the final few riders come thru and had a bit of a chat with a few of the organisers while waiting for the presentations. They kept getting pushed back so we ended up going back to camp for a well deserved wash and feed, before making it an early night. All in all it was a good day. Having done a few 100km races/rides before I thought this would have been a bit easier. I think my nutrition was what let me down the most, as I was fitter than when I had done the previous events. But next time(if there is) I hope to be even better prepared and have more training under the belt. 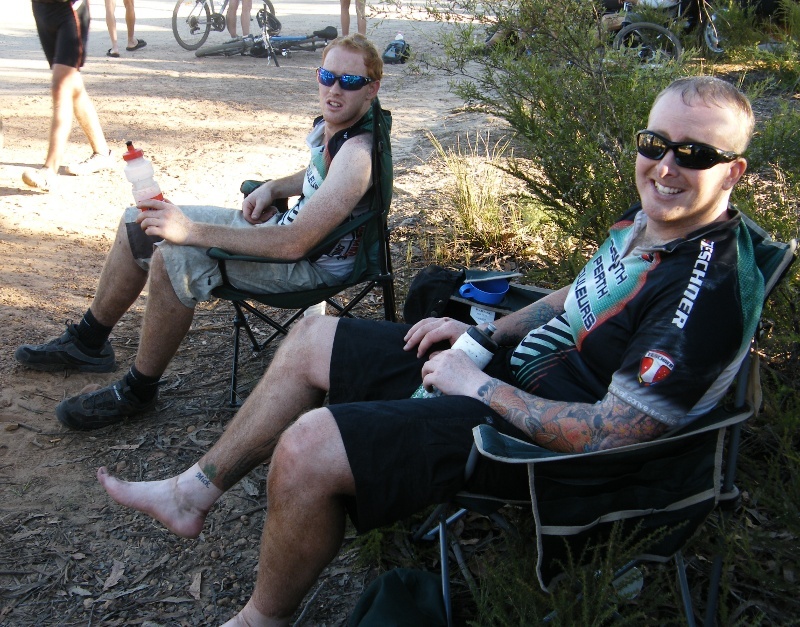 It had been almost 6 months since Dave & myself had been on the MTB bikes, too much scumming had made us soft we think. bit less of the paddocks, while generally ok, a few grass hidden holes seemed to catch some out. Other than that a big thank you to all the organisers and volunteers who helped make the day what it was. It is a well run event and really well supported by the locals, whether they were lands owners opening their land for use or helping thruout the day, Thank you. This entry was posted on 3 March, 2010 by Fairy. 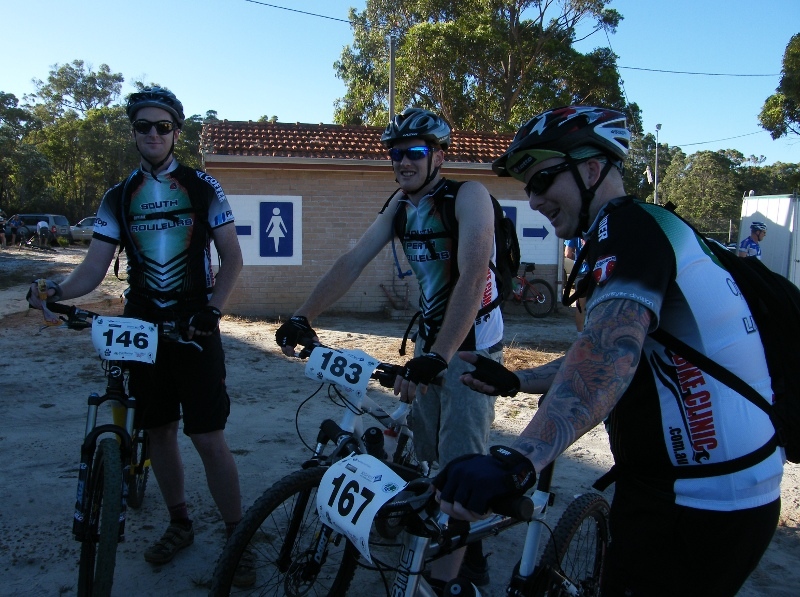 It was filed under MTB and was tagged with Cycling, endurance, hot, hurtlocker, MTB, Northcliffe, Round Tu It, southwest, SPR. Fantastic effort guys! Brilliant to see the SPR colours getting in the dirt! Looks like a long hard day. Hope the march flies didnt eat you alive! Wow Scott I felt the pain with you !! Tremendous Effort not sure if I will be up to it for next year after reading that !!! Lots of training will be needed and no torn quads for me !! !